Why was the horse naked? Because the jockey fell off. Interesting Fact: Saratoga Springs was the site of standardbred racing as early as 1847. On August 3, 1863, casino operator and future congressman John Morrissey organized the first thoroughbred race card on the track previously used for harness racing (and now the location of the Oklahoma Training Track). The current course was opened across the street from the old standardbred track the following year. Among those instrumental to the creation of the Saratoga Race Course were John Hunter (later the first chairman of The Jockey Club), William R. Travers, John Morrissey, and Cornelius Vanderbilt. 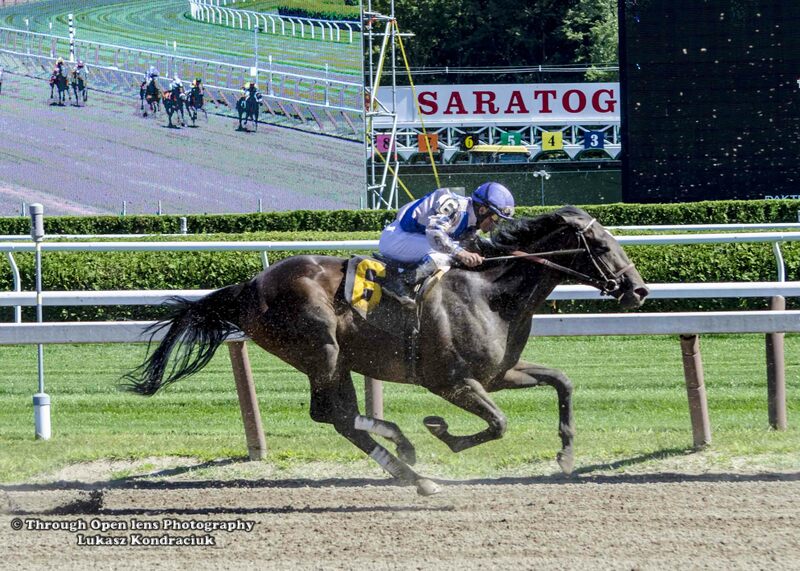 This entry was posted in Gallery and tagged action, animals, d7000, derby, f/5.6, fact, fast, fast moving, fun, going fast, History, horse derby, horse racing, horse racing track, Interesting Fact, jockey, joke, Nature, Nikon, NY, Photo, Photography, racing, saratoga, saratoga horse racing, saratoga ny, Saratoga Race, Saratoga Race Course, speed, sport, summer, Talk derby to me, track, travel. Bookmark the permalink. Reblogged this on Total Equus of the Heart.